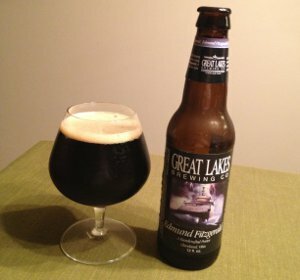 This marks the second beer I've had from Great Lakes that's named after a nautical disaster. The other, Burning River, was named after the tendency of the Cuyahoga River to catch fire. This one is named after a doomed freighter, the SS Edmund Fitzgerald, that sank rather suddenly and unexpectedly. Oh sure, there was apparently a pretty bad storm, but no distress calls were sent, experts are baffled as to what caused the sinking, and none of the crewmen's bodies were found. Plus, the so-called "Mighty Fitz" apparently suffered a number of mishaps during its maiden voyage, including a collision with a pier and the fact that the champagne bottle used to christen her refused to break the first couple times they tried. Somewhere in Ohio, a failed screenwriter clings to a tragically unused X-Files spec script attributing the sinking to aliens or perhaps an outbreak of giant fish-people. Oh yeah, the beer. This is apparently one of the country's best regarded porters. Not a style I'm particularly fond of; quite frankly, I find them to be a little bit samey (with the one exception being Everett, a beer I should have rated higher as it looms much better in my head these days than it did in comparison to other mind-blowing HF beers that day). I should probably rev up a double feature or two at some point to cut to the heart of the matter, but for now, I'll just continue to be a little baffled at just how beers like this get rated so highly by the Beer Advocate set. Maybe I just don't get porters. Beer Nerd Details: 5.8% ABV bottled (12 oz.) Drank out of a snifter on 10/5/12. Great Lakes continues to be a sorta ho-hum brewery for me. I quite enjoy many of their brews, but I've never really had something that really lifted my kilt, if you know what I mean. Still curious to try some of their bigger, seasonal/special release beers though. They get rated highly since they're good. At least you admit you don't really like porters. =) This really is one of the top porters, too, as the flavors meld really well and it's never acrid, too bitter, or anything. Just delicious. They are straightforward but that doesn't mean they're bad. But, yes, Everett is pretty awesome. I just like the mix of roast, chocolate, and body in a porter and the three you named are all quite good at what they do. I'm sure my friends would be surprised to hear me say this, but not everything needs to be an imperial stout. Oh, agreed. Similar things could be said about DIPAs versus English mild/bitter, or any number of other styles (3% saison vs 10% wild saison, etc..) What I might try to do is grab a few porters and drink them back to back and see what kinds of differences I can pull out. I've always found that process illuminating. This page contains a single entry by Mark published on October 16, 2012 10:33 PM. North Coast Old Stock Cellar Reserve was the previous entry in this blog. Smuttynose Gravitation is the next entry in this blog.